Apply the given discount code on the checkout page to get the discount. Verified on 23 Apr 2019. 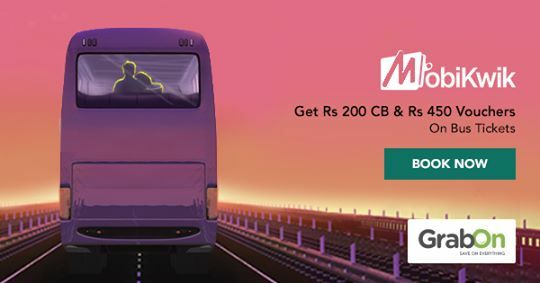 Mobikwik Bus offer brings 100% SuperCash on bus bookings. Maximum SuperCash will be Rs 350. No minimum booking amount to avail the discount. Apply the given Mobikwik Bus coupon code at the checkout to avail the offer. Valid only once per user on bus ticket booking. Now MobiKwik is offering 10% Instant Discount on Bus ticket Bookings when you pay using MobiKwik app. Maximum discount that can be availed is Rs 500. SuperCash will be credited in your account after a successful transaction. Mobikwik Bus is nothing but an easy and safe bus ticket booking platform that allows you to book bus tickets without any hassle. You don't need to waste time and stand in long queues to get the booking done. All the information is given to you, from the type of bus (AC/Non-AC) to the seating arrangement. You can pick your own seats without having to ask anyone or without being answerable to anyone. Online booking facilities have made our lives easier than before. Mobikwik Bus provides you a clear seat layout online so that you can choose the seats as is suitable for you. Mobikwik is one of the largest platforms for online transactions, recharges, payments and much more. Bus bookings is an additional service they provide. Their online bus ticket booking platform is as popular as the other services they provide. No doubt, they have a huge and loyal customer base of more than 5,00,000 customers all around the country. If you haven’t yet used this portal to book bus tickets, it is high time that you should. They have highly efficient customer care service to provide you support round the clock, they have a very easy to use booking interface and they have really good Mobikwik Bus offers in place. The most popular bus routes under Mobikwik Bus are Madurai to Chennai, Bhopal to Indore, Chennai to Bangalore, Madurai to Bangalore, Indore to Pune, Bangalore to Chennai, Coimbatore to Chennai, Hyderabad to Bangalore, Indore to Mumbai, Bangalore to Hyderabad, Chennai to Coimbatore and Coimbatore to Bangalore. And the popular cities to which the buses travel to and from to are Bangalore, Hyderabad, Surat, Chennai, Delhi, Mumbai, Madurai, Ahmedabad, Pune, Jaipur, Indore and so on. You can get exciting Mobikwik Bus offer and first booking offer to make it easier on your pocket. They have some of the best-known bus operators from all over India. Some of these are Shyamoli Paribahan Pvt. Ltd., SRS Travels, Diwakar Travels, Sea Bird Tourist, VRL Travels, Citizen Travels, Morning Star Travels, Mahalaxmi Travels, UPSRTC or Uttar Pradesh State Transport and many other names. So, wherever you are in the country, you can book a bus seat with your favorite travel partner at really low costs. You will simply have to use the discount coupons and promo codes that we have listed down here. Browse through the list of these deals and choose one that suits you the best. Either copy the code or activate the offer. If you copied the code, it will have to be used during checkout. And if you activated the offer, it will apply directly during checkout. How To Use Mobikwik Bus Coupons On GrabOn? If you break down the name Mobikwik into two words, one expands to mobile and the other one means quick. So, it is a platform that can be used for making payments, for bookings, to transfer money and for doing much more. Mobikwik Bus is a section of Mobikwik that makes bus ticket bookings easier than ever. They offer a ‘kwik’ payment gateway, which is easy to handle and extremely secure. Now, you must be wondering why should you choose Mobikwik Bus, since there are lots of other bus booking portals that are popular. Here are a few facts that is going to intrigue you. They offer a 24 by 7 customer support, they have more than 1,00,000 business playing all over India and more than 5,00,000 loyal customers in the country. They have such huge popularity that it becomes difficult to get tickets. So, book as early as possible. Some of the most known routes of Mobikwik Bus is Bangalore to Hyderabad, Hyderabad to Bangalore, Chennai to Bangalore, Bangalore to Chennai, Bhopal to Indore, Indore to Pune, Madurai to Chennai, Chennai to Coimbatore, Coimbatore to Bangalore, etc. There are great Mobikwik Bus offers in place. So that you miss out on none of these offers, we have listed down all of these together here. Check and copy one of these codes and use during checkout.